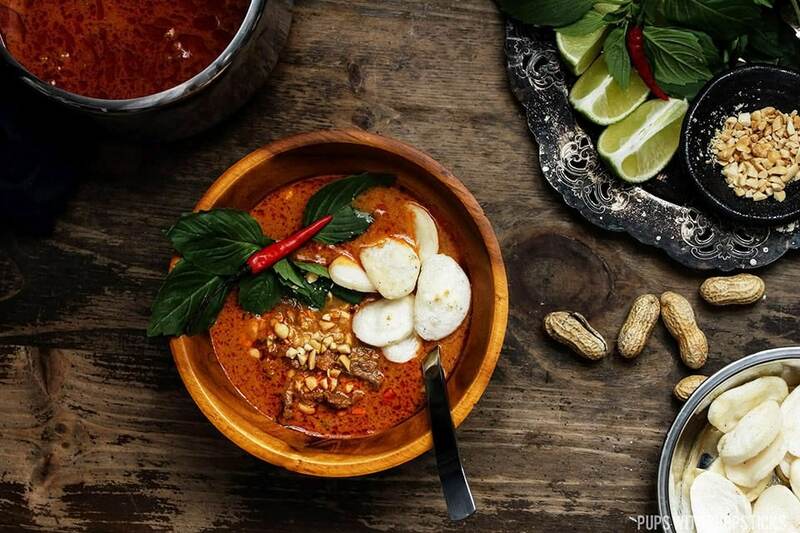 A warm and comforting creamy coconut Thai red curry that’s easy and quick to put together with many layers of flavours from the shrimp paste, coconut cream, kaffir lime leaves and condensed milk. More often then not, I find myself always leaning towards takeout especially during hectic times of the year. It’s easier to just blame it on my laziness but truth be told I just over think food and forget that delicious food doesn’t always have to be complicated and take a decade to make. 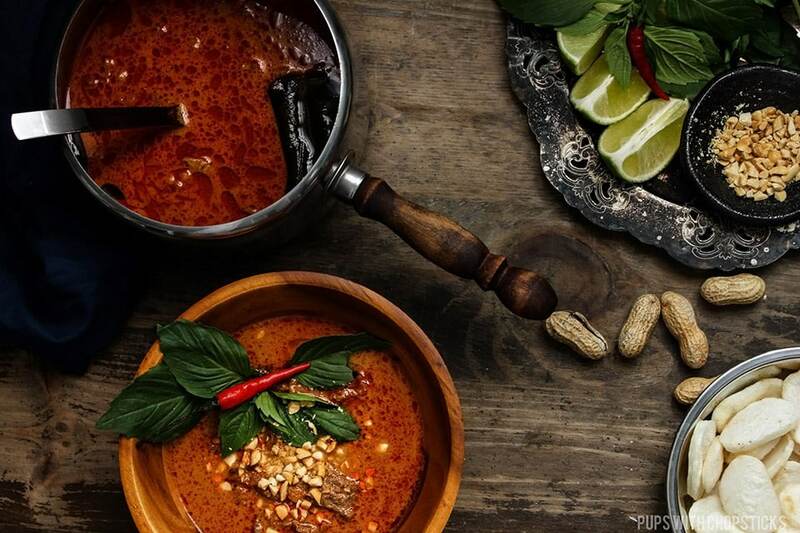 For this Thai red curry recipe, a few of the ingredients should be available at your local grocery store but a bulk of it (fish sauce, kaffir lime leaves, red curry paste and shrimp paste) might be harder to find unless you shop for it at an Asian grocery store. When you are shopping for shrimp paste, keep in mind that it is sometimes known as shrimp sauce as well. Look for a brownish gray paste-like sauce in a glass or plastic jar. Serve this with your choice of noodles or rice. I like to have mine with toasted rice cakes! Once I discovered how flavourful and full flavoured coconut cream was, I rarely ever use coconut milk now. Coconut cream has a more robust coconut flavour and provides a more creamy texture in anything it is used in due to it’s higher fat content. Unfortunately, coconut cream is not always easy to find but if you can find it then definitely use it. If you can’t find coconut cream, you can use coconut milk but make sure to find a higher fat content one – I find those types of coconut milk are a lot more flavourful. Try to also find a coconut milk without a gajillion chemicals – ideally you want to find one with just coconut milk (or coconut extract) and water. Coconut milks with a lot of added chemicals and preservatives don’t have as much flavour. 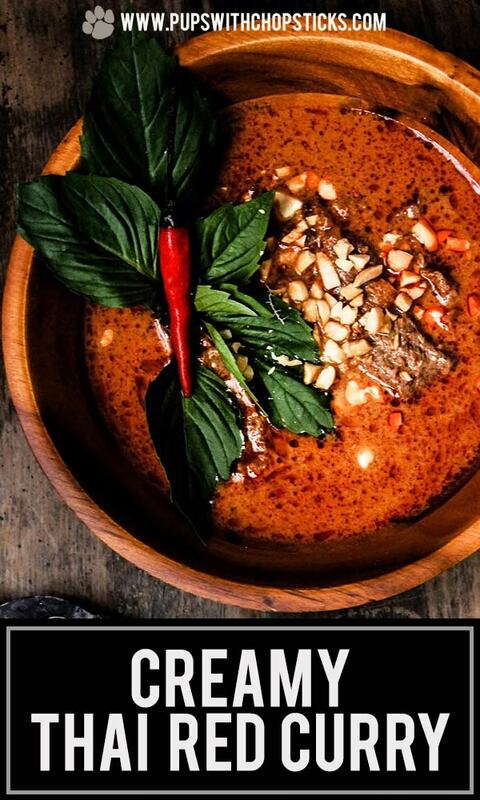 Fish – this also works very well in this Thai red curry. You don’t need to cut this super thin since fish is quite delicate and can break apart easily if it is sliced too thinly. For this recipe, I used condensed milk to give the curry a hint of sweetness but also give it an added creaminess as well. You can use palm sugar interchangeably with the condensed milk but the it will be slightly less sweet so tweak this to adjust this to your taste. If you substitute the condensed milk with white sugar, you will lose a bit of the creaminess – to compensate for that you can add an additional tablespoon of coconut milk. Keep in mind as well that white sugar is a lot sweeter than condensed milk so use half the amount of white sugar and work your way up slowly until it is at the right degree of sweetness for you. Have you ever noticed that whenever you cook any type of thinly sliced chicken or beef they sometimes come out dry and sometimes tough? I have a solution for that – it’s my two ingredient super simple meat marinade that I pretty much use in all my stir fries. It’s made of salt and water! It’s essentially a mini brine. The salt draws the water into meat and makes it super supple so that it is harder to over cook and dry out the meat. Neat eh? For this marinade, I rarely ever use salt though and I prefer to use either soy sauce or fish sauce instead. 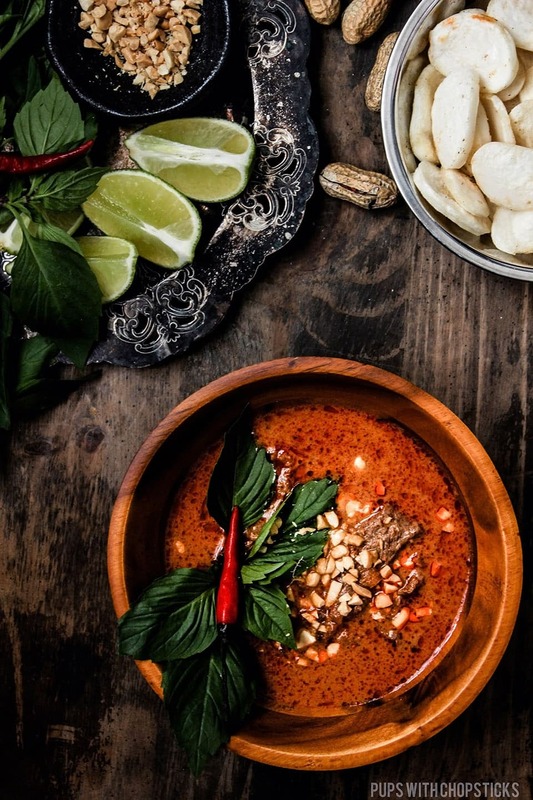 A warm and comforting creamy coconut red thai curry that’s easy, versatile and quick to put together with many layers of flavours from the shrimp paste, coconut cream, kaffir lime leaves and condensed milk. 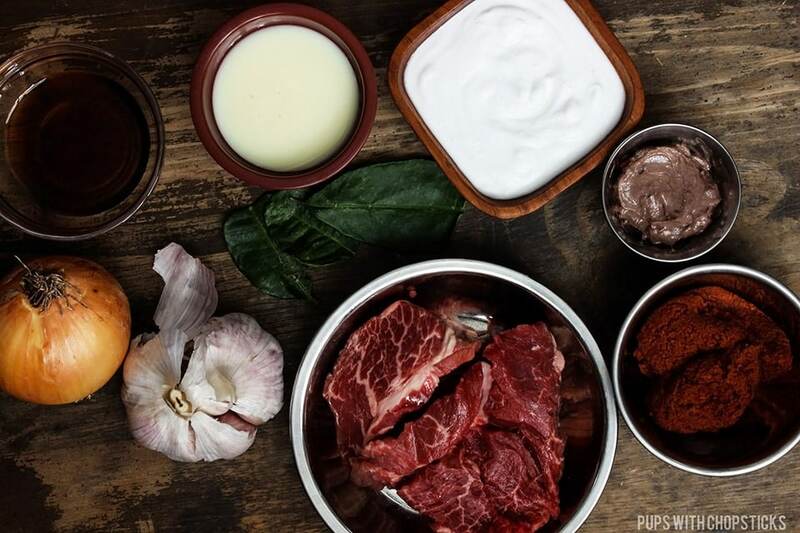 If you are using beef, chicken or pork as the protein – Thinly slice the meat and add in the marinade and set aside. 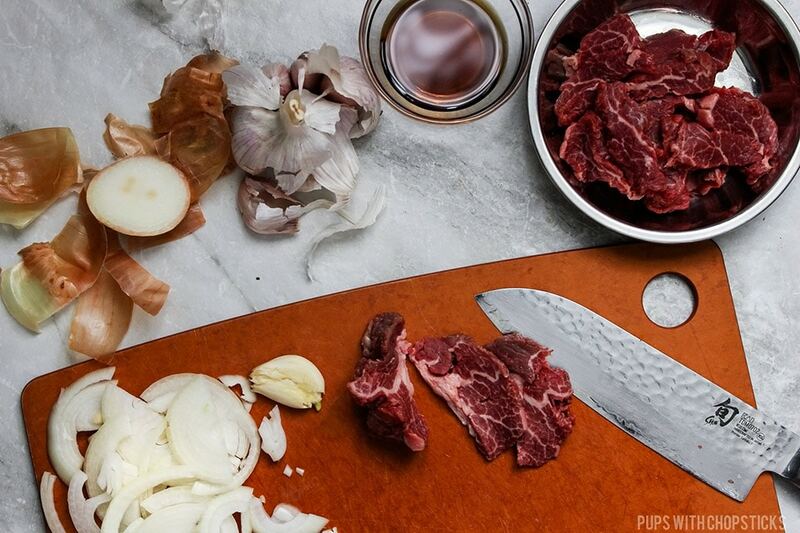 The thinner you slice this, the less time it will take to fully cook it. Add 3-4 tablespoons of oil in a pot and set the stove to medium heat. Once the pot is hot, add in the onions and saute them until they are soft, then add the garlic in and cook it for 1 more minute until it is soft and fragrant. 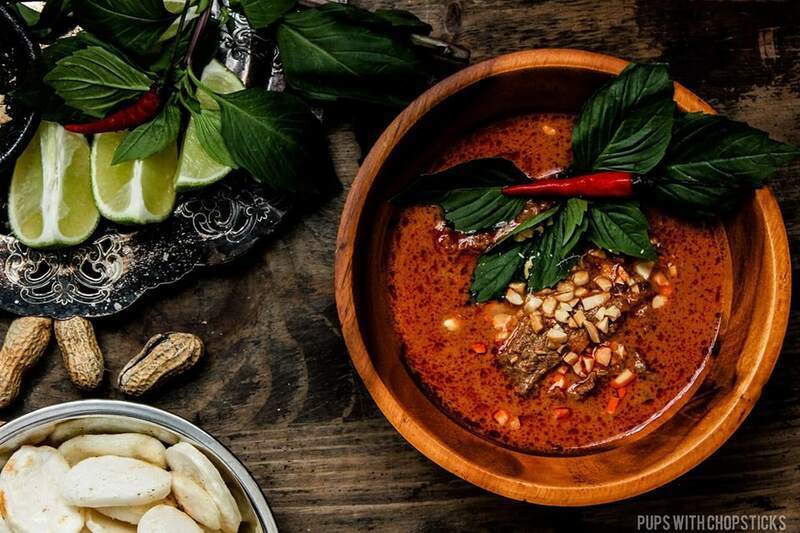 Add in the red curry paste and toast it for 1-2 minutes – it’s okay if some of it sticks to the bottom of the pot. Add the coconut cream and gently scrape the bottom of the pan to get all the red curry paste off the bottom of the pot. If you cannot find coconut cream, try to find a coconut milk with high fat content with as little preservatives and chemicals as possible. The ingredient list should ideally just be coconut milk (or coconut extract) and water. If you are using fish as your protein, try not to cut it too thin. Fish is super delicate and will break apart in the curry if it is cut too thinly. When shopping for shrimp paste, keep in mind that shrimp paste and shrimp sauce is used interchangeably. Look for a brownish grey paste in a glass or plastic jar. Damn, this looks so delicious! I can’t wait to try it myself. Thanks for sharing! Thanks Diego! Hope you enjoy it! 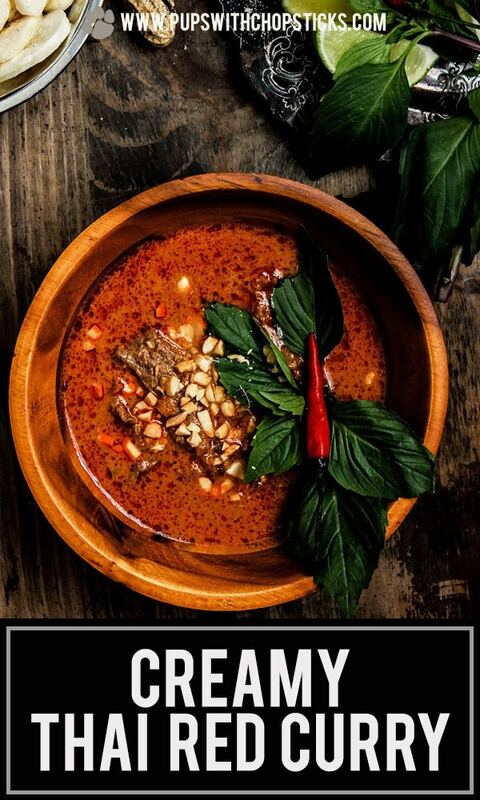 This spicy hot recipe is very stimulating to my appetite, I like spicy hot ingredients on my food, but yours is slightly different, adding condense milk… Good ! Making your own curry is always worth it, being able to control what you use and having the satisfaction of having something so delicious that you made yourself. This is a tasty sounding recipe with some lovely ingredients. Yes, I absolutely agree! There’s also a bit more substance to it too since you can load it up with ingredients as well 😀 and I love that! I love that you use coconut cream over coconut milk. I also appreciate your notes section with the recipe – I love alternatives. Thanks! 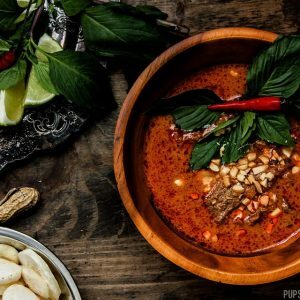 I love Thai curries! I try to have red curry paste on hand at all times. This looks wonderful! Me too! 😀 Definitely a must-have staple. Oh, this recipe looks amazing!